U.S. Rep. Chuck Fleischmann speaks to his supporters in the Doubletree Hotel's Vision Ballroom in Chattanooga after winning election on Nov. 4, 2014. 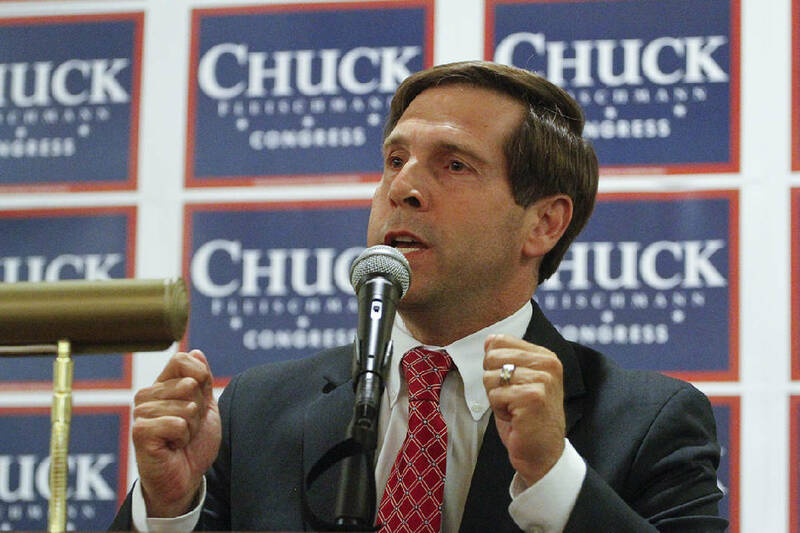 NASHVILLE — As he prepares to run for a fourth term, U.S. Rep. Chuck Fleischmann, R-Tenn., has taken to heart a lesson from his past two GOP primary challenges in Tennessee's 3rd Congressional District. And that's meant filling his campaign war chest early to ward off potential primary challengers. Or, at the very least, being well prepared to fight another battle should one erupt in 2016. "We've been very fortunate again," Fleischmann said in an interview Friday. "This year we have had three robust quarters. We will be filing with a cash-on-hand [amount] in excess of $785,000, which is really a wonderful situation for us to be in." Fleischmann said he believes the "vast majority of our constituents now in my third term have been able to see what I have been able to do as an effective leader in our Congress, working on so many endeavors, and they wanted to make a statement that they wanted me to remain as their congressman. And I'm feeling thankful for that." While he doesn't know if he'll get a GOP challenger, Fleischmann said he wanted this year to "remain absolutely certain on the political side that in the event we did get a big challenge that we would be vigilant, diligent and well prepared. And we are." In a solidly Republican district, Fleischmann first won the 2010 GOP primary in a multi-candidate, brutal slugfest to succeed then-U.S. Rep. Zach Wamp, R-Tenn. He then easily won the general election. But residual ill feeling from the 2010 GOP primary, a low campaign war chest and what has been described as Fleischmann's sometimes-awkward public style helped contribute to his drawing GOP primary challenges in 2012 from Weston Wamp, son of the former congressman, and Athens businessman Scottie Mayfield. Fleischmann won with 39 percent of the vote in that contest. In 2014, the younger Wamp challenged him again in a hard-fought, bitter contest that Fleischmann won by less than 2 percentage points. Then last spring, state Sen. Bo Watson, R-Hixson, told the Times Free Press he wasn't ruling out challenging Fleischmann. Even as he was saying it, supporters were pushing him to run and predicting he would. But in June, Watson said, "I don't just jump in because it's the popular thing to do or because people are telling me they don't like somebody for this reason, they don't like somebody for that reason." And he also noted he would likely have to raise $1.5 million if Fleischmann raised $1 million. Even then, Watson pointed out that beating an incumbent congressman is rare. Watson did not respond to messages left Friday and Saturday on his voicemail. Asked about Watson, Fleischmann said "he has not told me one way or another. Obviously he'll have to make that decision." The congressman said "the great thing about Bo is that we've retained our friendship and relationship throughout this process." Regarding any other potential opponent, Fleischmann said, "Right now I've not heard of anyone recently." Last spring, Weston Wamp told the Times Free Press he wouldn't run against Fleischmann in 2016, although he expected to run again some day and said someone should run against the congressman next year. The district, which runs from Hamilton County in the south up north through Oak Ridge, includes all or parts of 11 counties. Dr. Bruce Oppenheimer, a Vanderbilt University political science professor who follows Tennessee politics, said that "after three times in a row and twice as an incumbent, Fleischmann wants to discourage a challenger and that [a substantial war chest] is one way to do it." If Fleischmann is raising big dollars and "if Watson's having second thoughts, maybe that pushes it so he doesn't run," Oppenheimer said. "You know, it never hurts. . The challenger really needs to raise the money. The incumbent can always raise the money at some point." Five Republican activists and/or strategists in and outside the 3rd Congressional District say the window for Watson to run is either about to close or has already closed. It takes time to raise money as well as travel the district to become known. In the view of one Hamilton County GOP insider, Watson's interest stemmed from word of a meeting early on in which Fleischmann allegedly told financial supporters that his campaign had virtually no money. His last Federal Election Commission report from 2014 bears that out: As of Dec. 31, Fleischmann had just $52,563 in cash left. Remaining debts from the campaign against Wamp wiped that out. "This was coming on the heels of a lot of people who were still upset about Chip Saltsman and the kind of campaign he ran," the Republican said, recalling the hard-hitting Saltsman, who was Fleischmann's campaign consultant and former congressional chief of staff. As Watson's supporters and Watson began showing interest, however, the Republican said Fleischmann "got engaged." In May, Fleischmann held a Chattanooga fundraiser, bringing in House Majority Leader Kevin McCarthy, R-Calif., and raising more than $400,000. One state GOP strategist, not connected with either Fleischmann or Watson, was impressed by the congressman raising nearly $800,000. "Wow, that's pretty strong," he said. "The way we are now with congressional races you really have to get in early, like 18 months out. I don't want to say it's closed. But he [Watson] has got to pull the trigger real soon." Oppenheimer said, "I don't think it's closed yet because I don't think anybody's really focusing on [the election]. But you'd think he [Watson] has to be out there trying to raise some money or getting some commitments to be able to raise money." By January, Oppenheimer said, if Watson is running he "has to have some money on hand. The other thing is, you know, he should be starting to pound Fleischmann. And this is a great week to do it. You know, if you want to go after Republican incumbents and say 'these people don't know what they're doing, and you need to get someone in there who really does." That was a reference to last week's meltdown in the U.S. House when the refusal by 40 or so hard-right members of the GOP's Freedom Caucus to support McCarthy for speaker spurred the California Republican to abandon his effort. McCarthy was seeking the post after current Republican Speaker John Boehner announced he was quitting amid ongoing battles with the GOP's right wing. "Well, this is a good, thorough exercise in representative government," Fleischmann said Friday. "It's been an interesting time. But I'm the eternal optimist." Contact Andy Sher at asher@timesfreepress.com, 615-255-0550 or follow him on twitter at AndySher1.